Sing with the Schoodic Summer Chorus this summer! * Learn beautiful, unusual, fun music! * Perform at Hammond Hall and other Downeast venues! * Expand your vocal, musical, and choral skills! Rehearsals are Tuesdays 6-8:30 beginning May 21, with a few extras close to performance time. 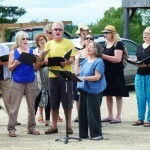 The Schoodic Summer Chorus is a multigenerational a cappella chorus directed by Anna Dembska. We welcome everyone who loves to sing exciting, beautiful, and challenging music. Our songs range from ancient to new and include languages and styles from all over the world. Adults $120, with discounts for students and families. Scholarships are available for all who need them. Anna Dembska has been teaching voice and musicianship for over 20 years, including at New York University and the Metropolitan Opera Guild. She is co-author, with pianist/educator Joan Harkness, of the music education books You’ve Got Rhythm and Piano, Body and Soul. Recent projects include Burnpile, a sound-art collaboration with California artist Bachrun Lomele touring museums, galleries, and flea markets across the US; director and soprano in the Ad Hoc Baroque Consort; Susan Bickford’s collaborative performance (stillness)16 on the Sheepscott River; and Music of a New Frequency, an improvising duo with vocalist Andrea Goodman.